6 April is celebrated as International Pillow Fight Day every year. Can you believe it? A day dedicated to this fun activity that can help you release all your stress. On this day, huge pillow fights are organised in cities around the world(Not Indian cities). Starting from the year 2008 when the first World Pillow Fight day took place, the movement has only grown. People hold massive pillow fighting events and have flash mobs wherein people indulge in hitting each other with fluffy pillows. However, I remember having pillow fights as a kid with my sister in a small in the North East and also how those little fights help me let myself lose while laughing my life out. BUT whenever I saw pillow fights onscreen, I was always disappointed because our pillow fights didn't look as cute as it looked onscreen. You may think it to be a petty issue, but no I won't brush it off under the carpet. Just like the idea of love and priorities in life, movies have ruined the concept of pillow fights for me. All my life I kept thinking how adults had better ways to pillow fight and that when I grow up, I too will be able to have those better, elegant-looking pillow fight that won't ruin my hair, or make me look like a dork while falling down. Most importantly I will be able to have the feather splash that Bollywood movies show making my pillow fights look picturesque. It will seem all dreamy and beautiful, and I will end it with the perfect looking laughter! BUT! Where are those feathers, perfect-looking laughter? I am here busy filing taxes and contemplating all my awkward mistakes since 1999 all these while I am glued with my phone. Where are all those perfect-looking pillow fights? Or even the awkward-looking ones? When did I turn into this anxiety-ridden, fake-smiling women in her mid-twenties who expresses her real-life woes via memes? Anyway, coming back to the pillow fights, to all the people out there, your pillow fights are just perfect, and it will forever be. Don't be fooled by what movies show you. Just like how they show you finding "true love" is the epitome of achievements and that stalking, harassment and toxic masculinity is actually how love looks like, to begin with even their pillow fights are a lie. 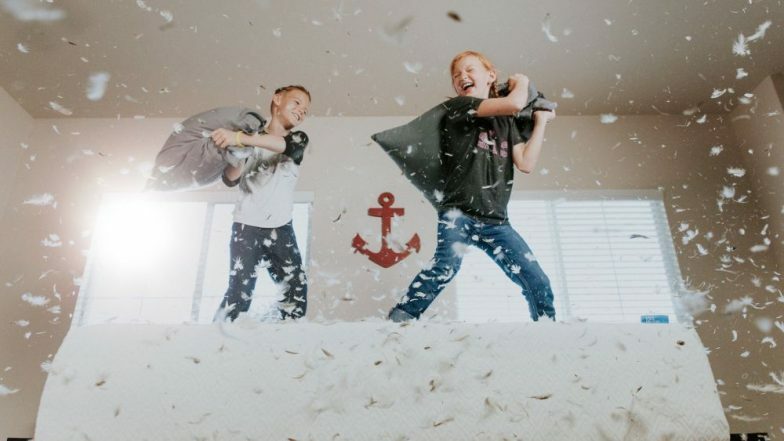 So, today on International Pillow fight day, go home pillow fight for therapy.